I have been asked repeatedly to create a page to honor ministers. I learned long ago that I've got to limit and carefully edit the images I draw due to the business of the dictionary text already on the page so creating something with too much detail really muddies up the drawing - creating a book page with loads of text does just that. I've challenged myself to create a page using a religious text and think this one works well. 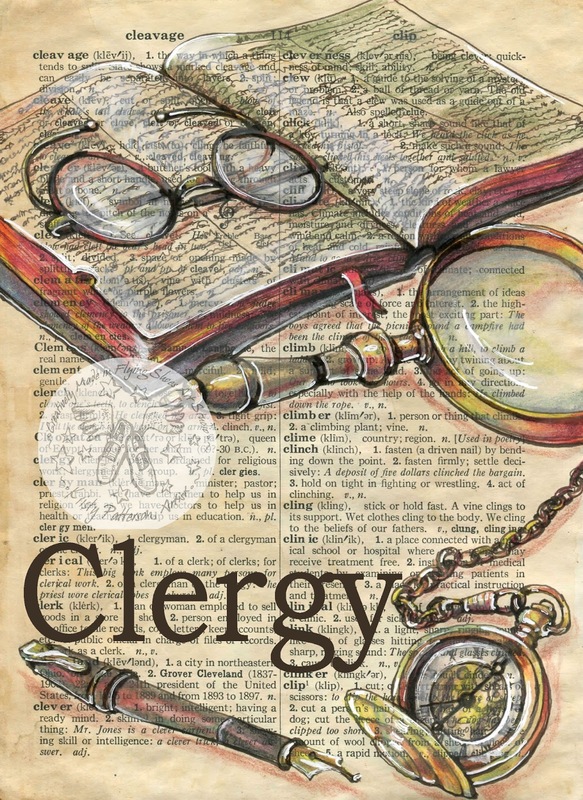 I love the definition of Clergy found on this page that describes the vocation as one who guides us in a healthy spiritual journey. 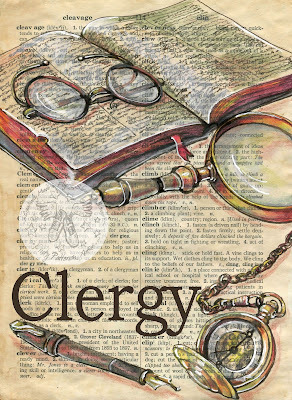 I stewed about what images to use and decided eyeglasses for seeing clearly, a magnifying glass representing close study and examination, a pen for writing and communicating insight and a pocket watch to symbolize the dedication of a pastor's time in service to his congregation. I have to admit that I omitted a cross or other symbols of a particular religion. I have a strong faith but I didn't want to pay tribute just to my faith. I did add one personal tribute in my drawing. For much of my life our family has had a devoted shepherd who has been by our side through births, deaths, tragedy and triumph. He and his wife have remained dear friends even though they long ago left our community. They still are among the first to arrive when we need a shoulder. We are blessed by their love and compassion. So I put Pastor Terry's birthday as the time in the pocket watch. Thank you Terry and Becky for being our pastors and for being a lasting example of God's love and devotion.